This entrepreneur found enormous opportunities in starting small—selling quality street food. Reymont Choachuy got sick after eating street food in 2003. That got him thinking: Why not build a business selling ‘clean’ street food? With P350,000, the entrepreneur from Cebu put up Sam’s Everything on Sticks, a food cart business, at the Tutuban Center Mall in Divisoria, Manila. 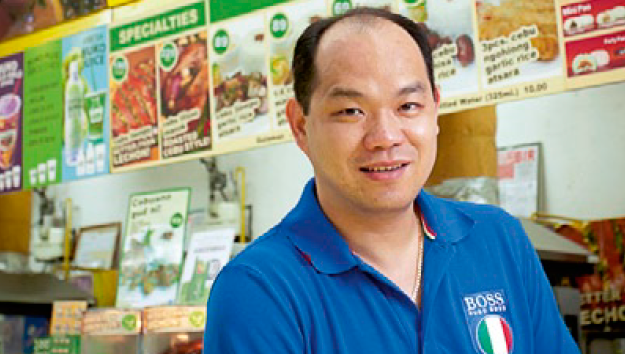 When franchise inquiries became too frequent to ignore, Choachuy hired a franchise consultant and set up a commissary. He hired professionals to standardize the business and train the staff. In 2005, Choachuy put up Noble House Business Brokers Inc. to become the umbrella company for Sam’s and his other ‘on sticks’ brands. These businesses also prospered, and in 2011, he opened two more food cart ventures, Liloan’s Pride Liempo and Tea 101. The company later diversified into the beauty industry with a nail spa, Oh My Nails. Today, these Noble House brands are rapidly expanding in Visayas and Mindanao through franchising. “Through the franchising model, we were able to help out people with smaller financial capital to start their own businesses,” Choachuy says. In fact, one of the company’s service crew franchised her own food cart business from Noble House. Choachuy believes investing in the right people will bring success to any business. “The staff that we choose must personify our organizational values. We also push the franchisees to screen the employees they hire based on these values,” he adds. This article was originally published in the November 2012issue of Entrepreneur magazine. To subscribe, click here.